Beautiful certificate from PetmedExpress.com, Inc. issued in 2002. This historic document was printed by GOES and has an ornate border around it. This item has the printed signatures of the Company’s President and is over 9 years old. 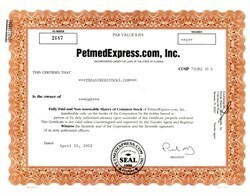 PetMed Express, Inc., doing business as 1-800-PetMeds, markets non-prescription and prescription pet medications; and other health products for dogs, cats, and horses. The companys non-prescription medications include flea and tick control products, bone and joint care products, vitamins and nutritional supplements, and hygiene products. Its prescription medications comprise heartworm preventatives; arthritis, thyroid, diabetes, and pain medications; antibiotics and other specialty medications; and generic substitutes. In addition, the company, through its Web site, 1800petmeds.com, sells beds, crates, stairs, strollers, and other pet supplies. It offers its products under the Frontline Plus, K9 Advantix, Advantage, Heartgard Plus, Sentinel, Interceptor, Program, Revolution, Deramaxx, and Rimadyl brands. PetMed Express markets its products through national television, online, and direct mail/print advertising campaigns. The company primarily serves retail customers. PetMed Express, Inc. was founded in 1996 and is headquartered in Pompano Beach, Florida.